Not a textbook or lesson planner, but ideas and inspiration for activities in-and-outside-of-the-classroom for teaching German as a foreign language, or other foreign languages, to students grades 6 – 12. “The book ‘Germans are Funny’ by Conrad Rehbach will be very helpful to many. It offers ideas and inspiration to educators well beyond the foreign language teachers. The pedagogical insights are deep and meaningful, and convey to the educator possibilities on how to teach adolescents in a ‘head, heart, and hands’ approach. From the Introduction to "Germans are Funny:" There is a wide variety of textbooks and materials available to teachers of German as a foreign language within the English speaking culture. 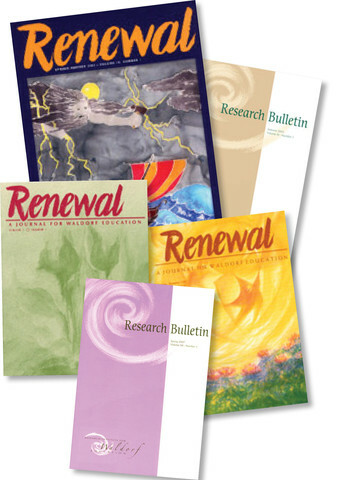 Much of this material is geared towards the grade school student or the college student. In my work as a teacher of high school age students, I experienced both a certain shortage of materials meant for this age group, and also a need to draw ideas for in-and-out-of-the-classroom activities from a great variety of sources. This book – although it might become a classic - is not a traditional textbook or workbook for students’ or teachers’ use, but rather a collection of exercises, ideas for classroom activities, and inspirational material for teachers to use and adapt to their own situation. 277 pages, 6" x 9", perfect binding, cream interior paper (60# weight), black and white interior ink, white exterior paper (100# weight), full-color exterior ink. Paperback cover. 277 pages, 6" x 9", perfect binding, cream interior paper (60# weight), black and white interior ink, full-color exterior ink. Hardcover. Copyright by Sophia Institute Publishing (Standard Copyright License). Edition: 3rd. Publisher: Sophia Institute Publishing. Published April 4, 2013. Language: English. File Formats: ePub and kindle. File Size: 16.88 MB. “Thank you for this book. It is an inspiration for my work in the classroom. I have already composed my own mystery dictations (in Spanish), and the students loved it … “ – Foreign language (Spanish) teacher, Wisconsin, USA. 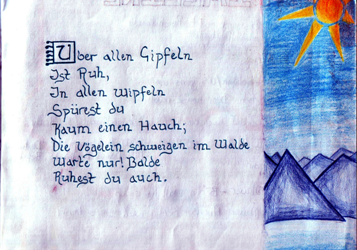 Drawn from many years of teaching German as a foreign language to Waldorf high school students (ranging from the beginners’ to the advanced levels) in an alternative Waldorf high school setting that included small classes in an innovative school environment, where flexibility and love for learning were equally important, this book is a collection of classroom materials geared towards students, grades 6 to 12, in alternative schools, charter schools, Waldorf schools or homeschooling. The material presented and collected here in this book is meant to be a supplement (and possibly an inspiration) to curriculum planning, course materials, and lesson plans. The material is grouped by activities and subjects, rather than sequentially reflecting levels of language proficiency. Most of the activities, exercises and texts can easily be adapted towards usage in classroom settings or with individual students of different levels of skills and knowledge of the German language, or other foreign languages. 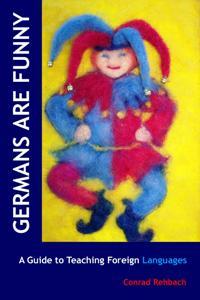 One valuable Waldorf-based resource for teaching world languages to adolescents is a book by Conrad Rehbach with the unlikely title Germans are Funny. (A 2011 poll of 30,000 people around the world determined Germans to be the least funny nationality!) Rehbach draws on his long experience teaching German to Waldorf high school students in America to share many helpful hints in making language lessons engaging and fun. Among the activities he has used to engage adolescents in language study are paying an imaginary visit to a German pizzeria, attaching humorous captions to random photos, reviewing the action in German in an Arnold Schwarzenegger movie, telling humorous stories about an exploding outhouse, reciting nonsensical but rhyming poems, and doing a treasure hunt that culminates in hidden bars of German chocolate. While the examples in the book grew out of Rehbach's German classes, the book is meant to be helpful to all teachers of world languages. The underlying message is that the world language teacher needs to be imaginative and uninhibited to get and hold the attention of teenagers. Decorum and a staid persona must be sacrificed at the altar of learning!